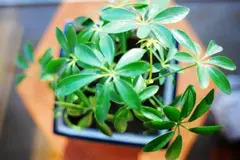 Saplera is a popular houseplant because it's easy to grow and adds fun texture with its divided hand-like leaves. Because it's so tolerant, Saplera makes a good choice for living, dining, family, and bedrooms. Many people are especially fond of growing it in well-lit rooms because at night the houseplant is efficient at filtering indoor air pollution from the room. 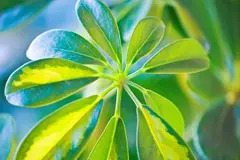 Care Instructions Saplera is an easy-to-grow houseplant that does best in high light but will usually grow fine in medium light. 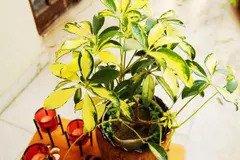 It can tolerate direct sun on its leaves indoors, even in hot-summer climates. Water Saplera when the potting mix dries out. It's tolerance of dry soil is one of the factors that has made it a popular indoor plant for so long. You don't need to fertilize Saplera, but if you'd like it to grow faster. If your Saplera gets too big in time, you can prune it back at any time. Note: This plant is not intended for human or animal consumption.